Exploring another place and culture through an enjoyable mystery in that setting has a long tradition -- readers have long appreciated vintage English village life through Agatha Christie's books, and many who will never reach Italy treasure Donna Leon's Venice. Scandinavian noir takes us to Sweden, Denmark, Finland, Iceland; the Brazilian series by the late Leighton Gage showed us a tender love of place and people coupled with the horror of crime driven by poverty and corruption. 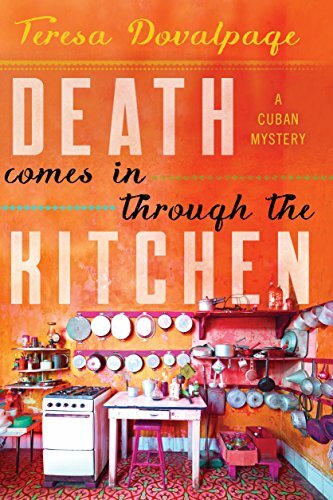 Now it's a delight to be able to look inside Cuba in 2003 in DEATH COMES IN THROUGH THE KITCHEN, the first mystery from accomplished Havana-born author Teresa Dovalpage (Soho Crime). 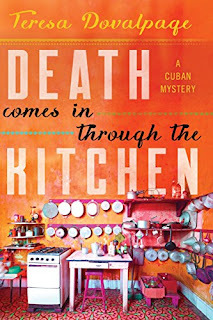 Dovalpage calls her book a literary mystery -- I'd rather liken it to the classic "recipe" mysteries, including the current Maine series by Barbara Ross and two food-focused series that Massachusetts author Edith Maxwell (aka Maddie Day) provides. DEATH COMES IN THROUGH THE KITCHEN opens with the arrival of totally inexperienced, unskilled tourist Matt Sullivan, who hasn't really thought out how complicated his situation is -- but he's coming through customs with a slightly used wedding dress, a gorgeous one, that he plans to give to his Cuban sweetheart Yarmila in hopes of gaining a loving commitment from him. The problem is, Matt really doesn't know Yarmi all that well -- she writes a cooking blog that describes delicious Cuban dishes and he's been following her via the Internet, in his role as a San Diego journalist trying to promote Latin cuisine. And his arrival during the height of Fidel Castro's police-maintained power means he'll be an under-the-table guest at a fiercely proletarian guest house, and an illicit suitor. But by the end of the second chapter, we readers know that Yarmi has been murdered -- and Matt, the ambitious American who thought he'd found his lifeetime sweetheart, is now both bereaved, and a murder suspect ... to both the police and Yarmi's, ahem, other connections. "Let's see. You meet this citizen, spend ten days with her, don't see her face to face again, send her tons of money," Lieutenant Martínez paused here for effect, "and come back ready to marry her. Is that correct?" "Yes, compañera," Matt let the reference to "tons of money" slip "That's correct." Soon Matt's desperation leads him to accepting help from a former police detective turned Santeria practitioner. But will the assistance be enough? And could there be too much benefit for all involved, by tagging Matt with the crime? I thoroughly enjoyed this romp through Cuba via Matt's naive perceptions, and look forward to the next in this series from Dovalpage -- because there's sure to be more about this set of wild and eccentric characters. New from Soho Crime (Soho Press), released today.